In October last year I was invited to the University of Miami to give a talk organized by Pat Saunders of the Department of English. They were launching their Caribbean art website and a whole series of activities had been planned around it. During my stay I was taken to the university bookstore where they had these beautifully packaged little dolls modelled on famous people such as Shakespeare, Einstein, Mahatma Gandhi and others. There was an entire shelf full of Obama dolls and a shelf full of McKain dolls. 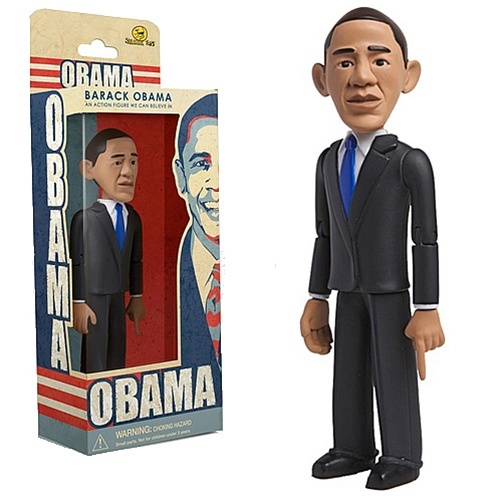 It was then that I realized that Barack Obama was going to win the US Presidential election by a landslide for the Obama shelf only had a handful of dolls left while the McKain one was practically full. And this in Miami, stronghold of Republican-leaning Cuban-Americans. The three of us scrambled for the few remaining Obama dolls and I managed to get my hands on one. Manufactured by Jailbreak Toys the Obama doll was advertised as “An action figure we can believe in.” Brilliant, I thought. That is certainly the image one has of Barack Obama, that he is someone who believes in action rather than rhetoric. And today he will assume the most powerful position in the world—the Presidency of the United States. What a day, what a day as someone once sang. Never before have people all over the world felt as involved and interested in American politics. I remember being taken aback at the response of David Lublin, Professor in the Department of Government, School of Public Affairs at the American University in Washington, D.C. when I asked if he was surprised by the extent of the interest worldwide in this last American election. He basically said that considering the dominance of the United States in world affairs it wasn’t surprising at all (this was at one of those media discussions the US Embassy in Kingston kindly invites me to. Participating in them has greatly enhanced my experience of the election). While Lublin’s statement is quite true, it made me wonder if the Americans didn’t fully realize how extraordinarily different it is this time. Lublin after all is a young, savvy, astute political scientist yet he didn’t seem to be aware of the unique interest this particular election had aroused worldwide. For instance American might and power has never made me take an interest in their political system before. Yet once Obama showed that he was a force to contend with I started to be interested; how far would this unusual candidate get? What would his tactics be? How long would the American political system tolerate this challenge from a political nonentity? I’m sure there were millions like me all over the world. And trust me Barack hasn’t let any of us down. And for a change neither has the United States, which has proved that its much vaunted democratic system of governance actually can and does work fairly. The Americans should be congratulated for that. The following Facebook conversation sums up many of the hopes and doubts people all over the world are feeling as the United States installs its 44th President, Barack Hussein Obama. Girl… the topic of today’s World Have Your Say programme is ‘Are people expecting too much from Barack Obama’… need I say more? Reality will set in after Tuesday…Obama will do great things..but he cannot turn water into wine…or rum!!!! He needs to sort that rum thing out though.. water into rum. He wld win wid dat! all might be true….but he is the first glimmer of hope people have had for a long long time. can he walk on water…NO can he cure the sick…not likely with his own hands….but he can and has restored hope where hope did not exisit and HOPE can cure….belief can. As a canadian, we hope our political administration could show this type of progression. I know what you mean Chas, but from where I’m sitting, the mania is a bit much. I get a feeling of lots of people will be sorely disappointed when he has to do unpopular things. maybe….but why we don’t let the man start his new job first…. I think part of the euphoria has to do with the fact that finally, you’re seeing some one who apparently has some integrity. That, to most people accustomed to brazenly corrupt or hopelessly lethargic alleged public servants is a huge breath of fresh air. There is no doubt in my mind the opposition and disappointment will come. After all, we are dealing with fickle humans, and fixing Bush’s mess will require tough, even harsh measures (LOL at Bush looking for absolution at this stage!). But I for one plan to give him a minute to sort himself: he deserves it and I believe my patience will be rewarded. Amen to that! Only time will tell if President Obama will really prove to be a stone of hope carved out of the rock of despair that Martin Luther King talked about in his ‘I have a dream’ speech. Happy Inauguration everyone! Happy inauguration Annie!! 😀 I’ve been grinning like an idiot all day… nonsensically, hysterically, because I’m happy to the 44th power!I’m too young to even begin to imagine the euphoria of the lucky people who saw MLK’s ‘I Have A Dream’ speech live. And I’ve always envied those persons who lived through some of the most awe-inspiring, and historically significant events in black history. But now (!! ), I’m getting my own little piece of history, and it is not something as grotesque and saddening as the 9/11 bombing… It’s actually one of ‘those’ moments. One of those events that I have heretofore only read about: <>I will not lose even a second of it…<> I am drinking it all in with heady, intoxicating pride, because twenty years from now, <>I<> will be one of those people who saw it happen… teehee!! I’m finally in on one of history’s big secrets… I too now have the inside scoop, and can tell other people that I saw it happen! I watched it live! !I seriously hope though, that people realise how <>human<> Barack Obama is. As much as we’d love to think it, he is not the Almighty Messiah. He is still just a man. And what’s more, he’s inherited the biggest mess in US history! It will take a whole lot more than moving speeches and lofty ideals to fix that!! I really hope people realise this (and I say this sadly because I already <>know<> that many don’t).Before Obama, I wasn’t interested in American politics beyond the point where it affected Jamaica and the Caribbean (and occasionally Venezuela). But now I am. I will be watching to see what changes Obama makes, how effective his method of governance will be, how the American people and the world will respond… America only just really got <>my<> attention!As you rightly said, only time will tell if Obama is all that he now seems to be. I’m willing to wait and see… In fact, I’m waiting to see…PS If Barack could turn water to rum, that would be the feat to beat for the century!! LOL. But then, considering Jamaica’s ailing sugar cane industry, we certainly don’t need <>that<> competition to contend with!I feel like I’ve talked myself into a stupor, and I really could go on and on… but I don’t want to make a post within your post, so I’ll put a lid on it now.Happy inauguration, Annie!! 😀 Yes we did! Ruthi,please make a post within my post anytime! still celebrating your return–just in time for this inauguration to boot.yes, now you have your own piece of history, that’s true, never thought of that from the point of view of younger gen. yu see why i appreciate yr viewpoint so much? Hey, really nice one. It’s so amazing that it’s taken this long, we in the Caribbean are so lucky in that respect, we’ve had leaders who were the same hue as us for a long time. We understand that it is not the colour of man’s skin that makes him, it is what he stands for, his ethics and his beliefs.BTW, you’ve been tagged. Thanks Annie for capturing this moment in time so sensitively yet rationally. Yes history was made and we are indeed fortunate that now our cynicism and despair can be questioned because the improbable has come to be perhaps the impossible too will become possible. I was really impressed that President Obama chose to make his inauguration speech far reaching yet down to earth, it must have been a temptation to wax eloquent and leave us with quotable quotes. What the speech lacked in poetry and drama it made up in substance and the flavor of the coffee we are beginning to smell (pun unintended but recognized)! Next Next post: Live and Direct from Washington, D.C.